Here in my Zone 4 garden we usually don't harvest tomatoes until the middle or end of July. This year spring was cold and wet. We didn't get to enjoy a tomato until the beginning of August. 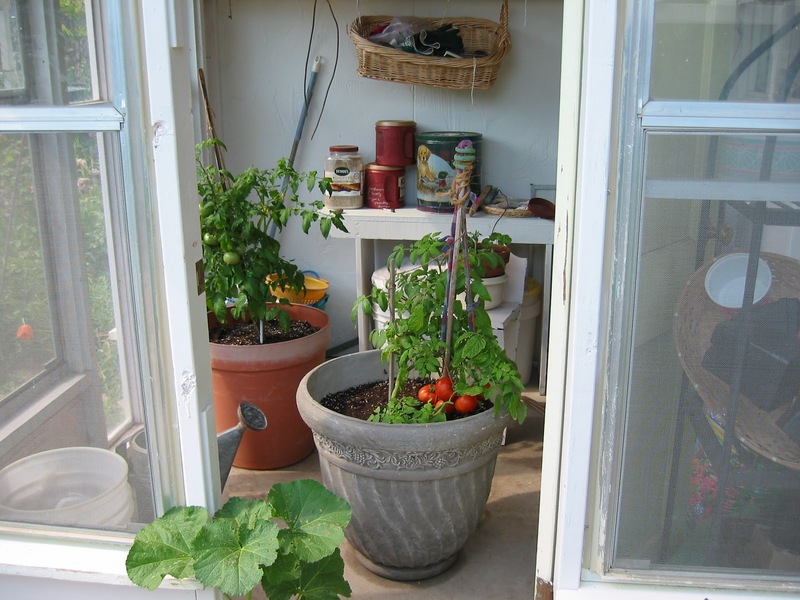 But, a couple of years ago on March 24, I started tomatoes indoors and in late May, I put them out in the protection of my little unheated garden house. To my joy I harvested 6 tomatoes on June 1st and another 7 tomatoes a week later. All summer these 2 potted Oregon Bush tomatoes produced beautifully. I started the tomatoes by seed, placed them under fluorescent shop lights, fitted with a warm and cool bulbs. As the tomatoes grew larger I added a fan set on low to blow gently on the tomatoes. I set both the fan and lights to run 14 hours. The fan, I added because I felt the slight air would strengthen the tomatoes. Here was the tricky part and the solution. 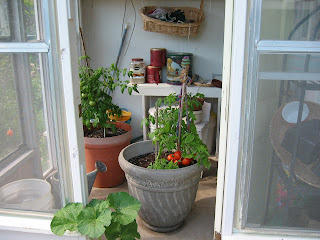 As the tomatoes grew, I popped them out of their little pots into bigger pots, planting the tomatoes deeper each time. Eventually they got quite tall and the moving of the tomato from the smaller pot to the larger pot caused the tomato to snap. Not a good thing. Fortunately I had quite a few plants to work with. Notice that only 2 tomatoes survived the process. The solution: I started lining the larger pot with a plastic grocery bag, with a small hole cut in the bottom. This made it easy to slip the whole bag into the larger pot. By the time the tomatoes went outside they were gently tied to stakes and living in 2 gallon pots. Outside, with the steadying help of my husband, I slipped them out of the 2 gallon pots. Voila! Tomatoes 2 months earlier than normal!! Last year I again started early tomatoes, but only used cool fluorescent bulbs. The tomatoes started fine, but did not flourish and set fruit. They needed both the warm and cool bulbs. November - My project today is to try to grow tomatoes and some peppers indoors that I can harvest during the winter. My first decision was the choice of plants. I wanted a short stature, determinate tomato. http://www.containerseeds.com/ has some great choices. I chose Red Robin. It's description reads: "A true miniature with great "real tomato" taste...This is a very cute little plant - everyone likes it. Will only grow about one foot high. Has the ability to set fruit under fairly low-light conditions, making it a good choice for indoor growing." I am in love! I am also a starting Feher Ozon Pepper, "a sweet, candle-flame shaped sweet pepper" and Sweet Banana Pepper, "excellent for salads, frying and pickling". I started the seeds yesterday. Use a seed starter mix, directions are on the package. I first hydrate the mix with hot water. Dry soil is very water repellent. I think warming the soil helps with germination. Years ago, the first time I started indoor seeds, I started several hundred. After they sprouted I didn't have the heart to throw them away, so I ended up starting seeds for friends and neighbors. No more! Modesty is knowing your limitations. I've grown indoor tomatoes before. They do great but they get so big and out of hand. I've not heard of the Red Robin but it sounds like a goodie. It is snowing, blowing, dreary here today. So, we tried our luck at the bread you and I were emailing about. It didn't rise very well. I'll blame that on me, not the bread. Tasted marvelous though! I will be interested to see how your indoor tomatoes work out. Maybe we will try starting some early this year. We are trying some indoor vegetables this year, but mainly leafy greens without added lights...just to see if it will work. Hi Gloria, thanks for visiting my blog. Good luck with your indoor produce-growing. Looks like fun. Gloria, I came to your blog from Blotanical. I'm also trying to grow tomatoes this winter, but I am able to carry mine outside during the day for natural sunshine. After growing nearly 500 pounds of them in my garden in WA this summer, everyone thinks I'm a bit crazy to continue growing some through the winter in AZ! But no matter when or where, there's nothing like a fresh, vine ripened tomato. You've inspired me to start my tomatoes earlier than I usually do. Last spring was so cold and wet in my zone 6 gardens that my tomatoes did not produce well. Thanks for the inspiration. are you using lights? a south window? I can't wait to see what happens (is it tomorrow yet?) I have seen in the Solviva book that Anna Edey kept indeterminate tomatoes growing for years in her house, hand pollinating them. The vines were 30 feet long! I have tried this unsuccessfully, but we have poor light indoors. Best of luck!